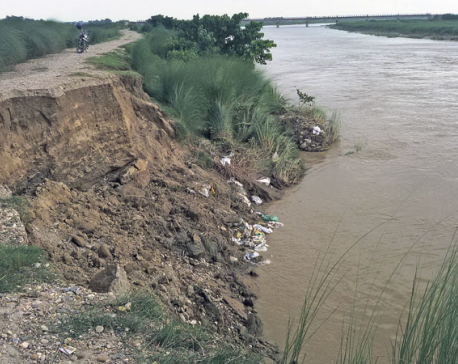 SARLAHI, July 17: Residents of Hajariya of Barahathawa Municipality-1 of Sarlahi district are worried about being displaced as the Bagmati River continues to increasingly erode their land. After inaction from the authorities, the residents collected Rs 3 million themselves and installed a breaker. However, a single breaker is not enough, according to Giri.The Bagmati River flows towards human settlements in the east while eroding nearly two kilometers of land. This has made many residents of Malaha very worried about being displaced. Chief District Officer (CDO) Drona Prasad Pokharel said they have not been able to work effectively to control the river due to budget constraints.“We have requested the stakeholders and authorities concerned for budget time and again but in vein,” he said.